Today, we are featuring Art of the Home apple tart tatin recipe – recette de la tarte tatin. The apple tart tatin recipe (or simply tart tatin) is basically a upside down apple tart with caramelized apples. With this apple tart tatin recipe you make your caremelized apples directly in the apple tart pan which reduces how many dishes you have to wash — always a plus when cooking! 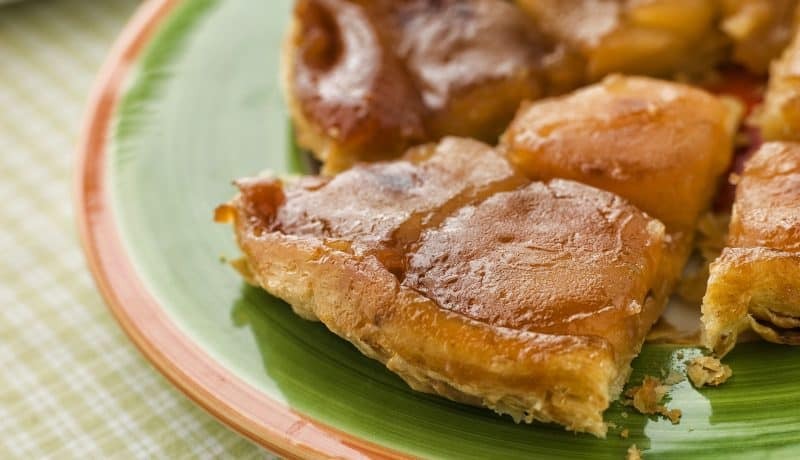 Check our detailed apple tart tatin recipe and Art of the Home suggestion below. Enjoy and bon appétit! Wash and peel apple. Cut them in half lengthwise and core them with a small pointy knife. For big apples, you can cut them in quarters. Put butter and sugar in round tart pan (with smooth edges and about 2 inches deep). You can also use a shallow enameled cast-iron dish such as this versatile Le Creuset tart tatin dish. Melt butter and sugar over high heat until the sugar becomes light blond which indicates that the sugar has started to caramelize. Remove from heat and arrange apples tightly next to each other in a circle. Sprinkle evenly with vanilla sugar and cinnamon then put back on the stove top but this time under low heat. Cook apples for 30 minutes, gently moving the apples from time to time to make sure they don’t stick. Remove pan from heat and let cool until the apples are warm. Lay the pie dough on top of the apples and tuck in extra dough inside towards the bottom of the pan (not outwards as you would do with a regular apple tart). Bake for 25 minutes and remove from oven. Don’t take the tart out of the pan when it is done cooking otherwise your apples will not stick together! Simply wait until the tart is warm (about 15 minutes). With a thin knife, check that the side of the tart are not sticking, then place a large serving plate on top of your baking dish, and turn it over to unmold. And voilà, your apple tart tatin is ready to enjoy. Decoration: You can also add a scoop of vanilla ice cream or a spoon of crème Chantilly (Chantilly cream) for decoration and a special treat, si bon!